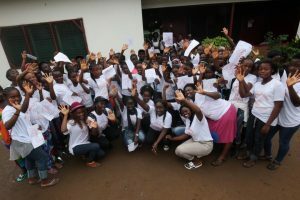 LitClub: LitClubs is a dynamic program for Liberian girls between the ages of 12-15. Implemented in conjunction with Litworld, the 6 month mentorship program enrolls 50 girls. A first of its kind in the country, the program follows a carefully designed curriculum which focuses on developing reading, writing and speaking skills. LitClubs offer children safe, structured settings to read, write, and raise their voices. LitClub members use their writing to become agents of change and hope in their communities. LitClubs are a place where children’s words change worlds.